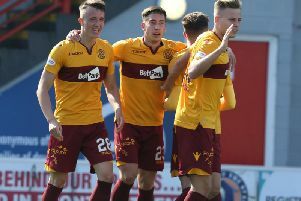 Motherwell manager Stephen Robinson hasn't totally ruled out sealing a sensational top six Scottish Premiership finish for his side this season, writes Craig Goldthorp. The seventh placed Steelmen trail sixth placed Hearts by six points and have just two games to claw back this deficit, at home to Aberdeen tomorrow night (Tuesday) and at St Johnstone on Saturday. As if that wasn't enough of a mountain to climb, 'Well's goal difference is also eight goals inferior to the Tynecastle side, whose final game before the split is at home to Aberdeen on Saturday. But Robbo said: "Football is a strange game. You can only take care of your bit. "If we can take three points tomorrow night and then again on Saturday who knows? "It's an outside chance and it's in Hearts' hands really. But we have to do our bit and more to the point we have to continue the run we're on and build the momentum. "We know where we went wrong. We know that the period in November and December has cost us and that our squad isn't quite possibly strong enough. "And we have to look at that. We have to make sure players step up to the mark or we sign other players that can do." For the Aberdeen game, Motherwell have injury concerns over striker Nadir Ciftci, who is doubtful, and defender Charles Dunne who faces a late fitness test.